Blog Too busy to be marketing your real estate photography business? Too busy to be marketing your real estate photography business? "I don't have time to be doing any marketing at the moment because I'm too busy shooting!" This is a common situation for a LOT of photographers who switch between being super busy and being scarily quiet, but they only work on marketing their business and reaching out to dream clients when their business is quiet and they don't have a lot of photo shoots to do. So what can a photographer like yourself do about it? How do you manage the workload when you have lots of photo shoots to get done? I think this is one of the simplest and smartest things you can do. I've spoken about this in another video and blog post called "When to outsource your photo editing". Think about how much time you spend editing at the moment when things are busy for you. Would it be 10 hours a week? Maybe 20? Imagine if you could invest just about all of that time you currently spend editing, and put that into your marketing instead. Sure, it's going to cost you financially to have someone else do the photo editing for you, but look at the numbers and I think you'll see that they work pretty well. Let's say you do 15 photo shoots a week, and each photo shoot costs you $20 in editing costs. So we're looking at $300 per week in editing, but you are now free to work on developing relationships with your dream clients. If that's something that you weren't able to do before, but can now, then that's worth a lot more to you than the cost of photo editing, no doubt about it. What other tasks could you be outsourcing beyond photo editing? There are people who you can hire to do just about anything these days, and it might be worthwhile carefully thinking about everything you do to see if it's worth paying a little to get some of that valuable time back again, and enable you to build your business in a sustainable way. During a regular day how much time would you waste chatting with friends on Facebook, watching videos unrelated to work, or being interrupted by other people, pets, and stuff going on? If you were able to be more efficient with your day, maybe you could squeeze out an extra 30 minutes or even 2 hours from each day, and you could commit that time to intentionally building your business. Take a careful review of what you are doing, maybe note down what you do currently each day in 15 minute blocks, and see what you can change to get just a little bit of extra time that you can put into marketing yourself. Even if you have a lot of photo shoots coming in I'm pretty sure you'll still be able to find some time in your day somehow. Marketing your photography business with just 2 hours per week? 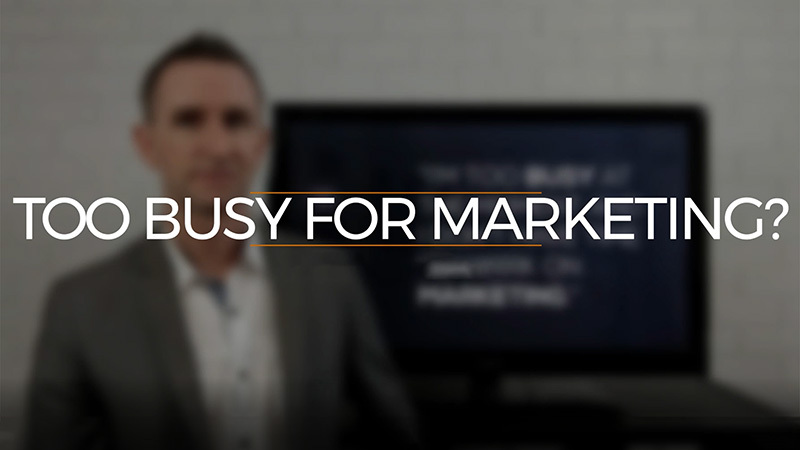 Of course, being efficient with your time might also mean being more efficient with the time you commit to marketing. For example, one of the things I do with my photographer clients is help them get a marketing system going that requires just two hours of work each week. Now this is not a perfect situation, because committing more time to marketing has got to be what you aim for, but what I'm talking about here is a minimum amount of work that a photographer should be doing each week throughout the year. But even though this is the absolute minimum, if a photographer was to do this list of 9 activities each week, then that photographer is going to have a great online presence, they'll be engaging with current clients, and they'll be reaching out to new prospects every single week. Marketing your architectural and real estate photography business doesn't have to be something that takes up an entire day or more of your time each week. It can be done with very little time, if you plan things well. This may not sound like the most attractive idea, and you might feel that you work hard enough already, but if you currently outsource your photo editing, and if you're already working very efficiently and you still don't have time to do any marketing, then maybe you need to extend your days. Perhaps you could get up at 5am before the rest of your house wakes up, and get some exercise done before sitting down at your desk and carefully planning your day. You know, one of the worst things you can do is simply rock up to each day, open up your emails, and just start replying to those. Studies have shown that people who plan their day work better, so maybe a bit of early planning so that you're working on the right stuff, not the wrong stuff, could help. Or maybe you could stay up extra late for one or two nights each week. So maybe when others head off to bed you could head down to your office and put in an hour or two then to get on top of the things that you weren't able to fit in during daylight hours. Perhaps you really are doing the best you can, or maybe you have no idea how to handle all of this and you're looking for someone to guide you along. Either way, perhaps it would help you if you had someone assist you with your marketing. For example, I run a program for architectural and real estate photographers called The Real Estate Photography System. It's a coaching and training program where I write marketing letters, emails and more, and design a lot of other tools and resources so that members of the program can spend less time working on their marketing and more time shooting and building relationships with their clients and prospects. How might this help you? Well, I write a monthly newsletter for my team members, and that saves them a few hours each month. I also write marketing letters and emails, as well as educational marketing material that a photographer can share with a real estate agent, builder, hotel or designer that they would love to be working with. Again, that saves the photographer a lot of time because all they need to do is copy and paste the content and they're right to go. I also create videos that the photographer can use, I help them with content for their website and their social media channels, and much, much more. Click here to find out more about my marketing and training program and how I help architectural and real estate photographers get their marketing in order.